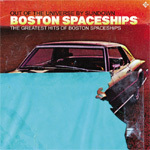 Fire Records are delighted to bring you a compilation of the very best of Robert Pollard's Boston Spaceships in a superb compilation "The Greatest Hits Of Boston Spaceships: Out Of The Universe By Sundown". This is the first time that any material by Boston Spaceships has been available outside of the US in anything other than import, and this collection selects the very best nuggets from their brief but productive career brought together in succinct form. Between 2008-2011, Boston Spaceships released five albums, beginning with Brown Submarine, a pop punk album made by guys who've worn out the grooves on their Cheap Trick, Alice Cooper, Wire and dBs record, and culminating in the 75-minute double-LP masterpiece, Let It Beard, one of the most ambitious, varied, sprawling, and yet entirely coherent records Pollard has ever made. Let It Bleed features a variety of sonic textures, in part courtesy of a host of guest guitarists/luminaries including Colin Newman (Wire), J. Mascis (Dinosaur Jr.) and Steve Wynn (Dream Syndicate). Although heretofore released only in the U.S. on Pollard's self-run Guided By Voices Inc. label, the albums consistently garnered four star reviews and raves from Mojo, The Times and other astute UK publications. At its best (which was most of the time), Boston Spaceships fused the surreal humor implied in its name with some of the most poignant, profound melodies/lyrics Pollard's ever written. Also, the Spaceships totally rocked. In 2011, Pollard decided he could never top Let It Beard, and broke up the band. Since then he's obviously been kept busy by the Guided By Voices reunion and the unexpected fruits thereof (three albums in one year!). All the better, then, that fans outside the States now get to hear the pure rock gold of Boston Spaceships in its most refined form. So twist open a Miller Lite, crank the volume and toast one of the great rock bands of the early 21st century.